J.I.D. is known for his speedy and lyrically dense bars that match and often exceed the skills of many seasoned rap veterans. 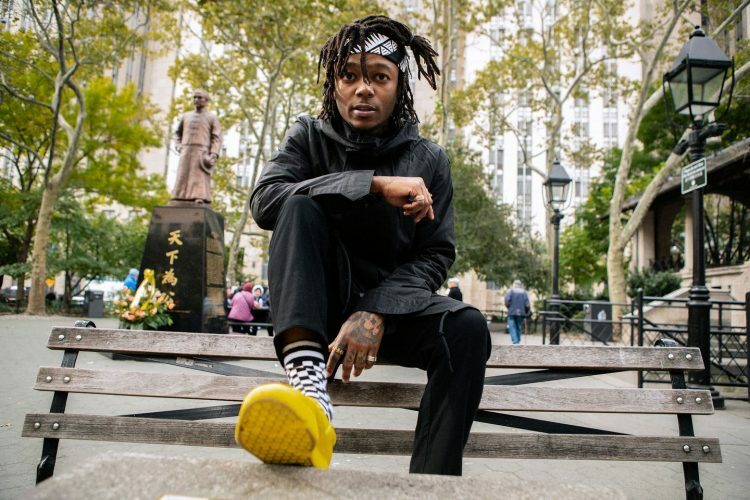 The debate within the hip-hop community concerning the most talented youngsters in the game requisitely includes J.I.D.’s name and this is evidenced by his appearance on the 2018 XXL Freshman cover. Each summer XXL showcases their picks for the nine best “freshmen” in hip-hop and #1 fan-picked artist to be included on the cover of the July issue of the magazine. This cover gives the artists included incredible publicity and access to a mainstream audience. The artists are not only photographed for the cover but also participate in a cypher rap as well as individual freestyles. J.I.D. is making a robust case for being one of those rare, special artists that approaches the mic and continually exceeds expectations. His lyrical ability is not only demonstrated in his ability to craft explicitly descriptive bars into cohesive tracks but also in how it is tied together by his niche flow typically marked with utterly impressive speed. The aspect, though, that I think sets J.I.D. apart from his contemporaries is his ability to diversify his flows, often hopping in and out of multiple different flows within one song. This is something that is very difficult to do in addition to maintaining skillful lyricism and what has become the most prominent skill of many of the most highly touted artists within hip-hop such as Kendrick Lamar, Lil Wayne and Andre 3000. “DiCaprio 2” begins with a skit similar to his debut album, this time featuring the comedic audio from a man apparently flipping through different programs on the television. This would align with at least a part of the theme of J.I.D. seems to be going for with this album being named after one of the highest regarded actors, Leonardo DiCaprio, as well as featuring what appears to be a photo of him. I say “appears” because while the photo is for all intents and purposes DiCaprio, the person seen is actually a Swedish DiCaprio look alike. These sorts of technical rhymes are what J.I.D. has become known for and just simply isn’t something most rappers possess the ability to do. “Westbrook” featuring A$AP Ferg, “Off Deez” featuring J. Cole and “151 Rum” follow and all are displays of just how well J.I.D. can control and manipulate his technically proficient rhymes. “Off Deez” and “151 Rum” were the singles released prior to the album drop and are both naturally standouts featuring astoundingly quick rhymes bound to impress any listener. The best feature throughout the project is expectedly that of Cole. The founder of Dreamville and an all-time hip-hop great at the young age of 33-years old, Cole just goes buck wild on “Off Deez.” A track meant to just be two lyrically exceptional artists displaying their boldest bars with no need to stick to any specific artistic aim is bound to produce some crazy moments. The rapid and bouncy beat of the song is matched with fast, flowing lines by both J.I.D. and Cole. My favorite part of Cole’s verse comes in the middle of it, and it is easy to miss everything that he is saying considering his fast pace. These sorts of lyrically dense bars are a clear strength of the “DiCaprio 2” album. And this is what’s expected of a J.I.D. album. His ability to deliver here, while it only is one aspect of the project, does help deliver the message that J.I.D. is not your average rapper. Skills like his are rarely heard, and as a young artist, this is a critical point to deliver on during the early stages of a career in music if it is going to be sustainable. Rather than going for the highest album sales and return on profit, young artists should work on cultivating their sound and once they do that they will not only see the sales come but have a chance at true longevity in rap. J.I.D. has made it clear via Twitter that he understands this is all a process and he is embracing it. This sort of dedication to the art rather than seeing rap as an avenue to make money is undoubtedly a sign of great potential in J.I.D. J.I.D. mostly stays true to his talents as a lyricist and pushes his words and storytelling ability to control each song on the album. The tradeoff to this is that his production comes across as a bit lackluster at times. On “Tiiied” featuring 6LACK and Ella Mai, J.I.D is taking it a bit slower and appealing to a more R&B taste rather than hip-hop. J.I.D. has done this successfully in the past on songs like “Hereditary” from “The Never Story,” but on this particular song the autotune on his singing voice is a bit much and begins to sound too stereotypically R&B and too far from J.I.D.’s character as an artist. In addition to this, the beat isn’t developed enough to engage listeners for the four minute run-time. Simple, repetitive drums and eerie 2000s chimes make me wonder whether or not this song should have been second-guessed to make the final cut of the project. “Skrawberries” featuring BJ the Chicago Kid is a slightly better take on an R&B track from J.I.D. because he raps and lets BJ handle the R&B he is talented with. Still, it doesn’t rise to being one of the better songs on the project. J.I.D. does best when he stays committed to hip-hop. The New York homage and marijuana tribute “Hot Box” is one of the most complete tracks because J.I.D. plays to his strengths spitting bars over a New York-esque boom-bap beat alongside Method Man and Joey Bada$$ who accentuate the lyrical ability throughout the track rounding out the song. The deeper dedication to hip-hop that J.I.D. displays on “DiCaprio 2” make this project a very enjoyable listen for me. The clever bars and quirky lines I have come to know and recognize J.I.D. for are not in any shortage on “DiCaprio 2” and this all but guarantees J.I.D. is making good music. “DiCaprio 2” does not come without its shortfalls though – some songs seem to run longer than they need to and J.I.D.’s ambition at times chases him into creating songs that just don’t stick the landing. Overall, I give this album a 7/10. J.I.D. does what he needs to do with “DiCaprio 2” and satisfies his core fanbase while also making music sure to attract new fans. J.I.D. will continue to evolve and perfect his style with each album as it seems he has done with this one. Ultimately the project has too many forgettable beats and not enough “WOW” moments to push this album above a seven. J.I.D. needs to find a way to attach his style to an identifiable production sound. The more he does that, the closer he is to making himself a household name. In my opinion, he is well on his way.